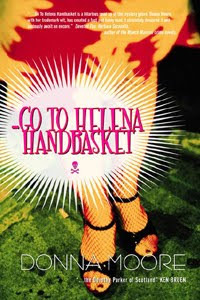 Donna Moore is the author of ...Go to Helena Handbasket which won the Lefty Award in 2007 for the most humourous crime fiction novel. She has had short stories published in various anthologies - Damn Near Dead, Hell Of A Woman, and Best British Mysteries, as well as online for Pulp Pusher. 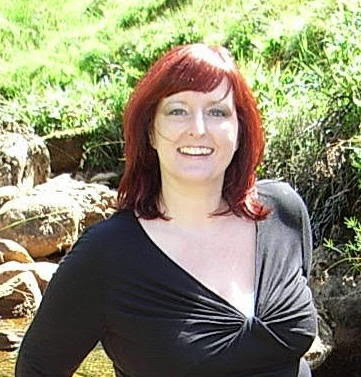 Donna runs a blog called Big Beat From Badsville which focuses primarily on Scottish crime fiction. Her greatest adventure was traveling to the wilds of the Alaskan Bush two years running to teach creative writing in Yup'ik schools. While there, she held a short story competition for the students and produced an anthology of their stories and poems. She is still in touch with many of the teachers and students and hopes to go back again very soon. Her second book - OLD DOGS - is coming out next year in both the UK and the US. 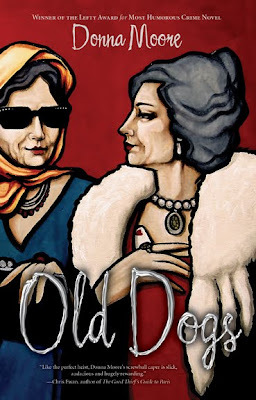 OLD DOGS is a crime caper set in Glasgow. It features two septuagenarian ex-hookers turned con artists who decide to steal a pair of golden, jewel-encrusted Shih Tzu dogs from a museum. Unfortunately, they're not the only ones after the dogs - including a pair of Glasgow neds, an out of work insomniac bent on revenge, and an innocent young Scottish islander who wants the dogs returned to the Buddhist monastery they came from. Oh, and there's an Australian hitman after the elderly con artists. As I live in Glasgow, and have a blog dedicated to Scottish crime fiction, I thought I would talk a little about the rivalry between Glasgow and Edinburgh - both in crime fact and crime fiction. A wide variety of crime fiction writers ply their trade in Scotland. Glasgow and Edinburgh, in particular, seem to have more than their fair share. You’d be forgiven for thinking that the River Clyde is chock full of dead bodies, or that there aren’t enough watering holes for the protagonists not to bump into each other at every turn. Well, I can’t vouch for the number of dead bodies in the Clyde, but Glasgow, at least, certainly has enough pubs. But first, just the facts ma’am. Scotland is home to around 5.1 million people. Edinburgh, the nation’s capital in the east, has around 472,000 residents in its 100 square miles. Glasgow, in the west, is only 67 square miles but is Scotland’s most highly populated city with around 580,000 residents. A 50 minute train journey separates the two cities, but they’re separated by a heck of a lot more than that. Glaswegians say that the best thing to come out of Edinburgh is the train to Glasgow. Not surprisingly, the phrase is repeated slightly differently if you’re from Edinburgh. Edinburgh is really dramatic and scenic. It’s built on seven hills and there are some really spectacular views. And it has a castle, lots of tourists, and more than a few blokes in skirts wailing on bagpipes. It’s also the home of Scotland's parliament (personally I think that’s because politicians are too scared to come to Glasgow). The parliament building caused a big stramash in Scotland because the cost of £431m was 10 times over budget. To add insult to injury, it was 3 years behind schedule, but, hey, what's £390m-odd between friends? House prices in Edinburgh are high, and the major employers (well, until recently perhaps) were banks, building societies and, obviously, really slow builders. Glasgow is, and always has been, an industrial city and centre of trade (originally built up by tobacco merchants who built themselves swanky houses and tried to outdo each other). It was also a major shipbuilding city, before shipbuilding went into decline. It used to be very grimy, with all the buildings covered in centuries of dirt and soot but in the 1980s there was a major city wide clean up and all the buildings were steam cleaned and rejuvenated. Both Glasgow and Edinburgh have wonderful old buildings in the city centre. A lot of these used to be fancy townhouses, but are now mostly offices. I prefer Glasgow's buildings - most of the city centre of Edinburgh is made of gray stone, and looks spectacular but cold. Glasgow is known for its blond and red sandstone buildings and it feels altogether warmer. And it’s not only the buildings. There’s a lot of rivalry between Glasgow and Edinburgh and a lot of this is due to the perceived differences between its residents. Edinburgh and its people are seen as snooty, middle class, reserved, cold, serious, elegant, more refined. 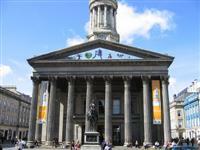 Glasgow and its people are seen as down to earth, working class, humorous, livelier, warm, friendlier. There’s an old saying amongst people in Glasgow that there’s more fun to be had at a Glasgow stabbing than at an Edinburgh wedding. That tells you a lot about both places. I would like to add that I have been to an Edinburgh wedding and I had a whale of a time. I’m unable to vouch for the fun factor at a Glasgow stabbing. Perhaps my invitation got lost in the post. And I’m not even going to mention the football rivalry. Glasgow drunks are funnier than Edinburgh drunks. If you get stuck next to one on a Glasgow bus, he’ll be more likely to sing you a Frank Sinatra favourite (My Way is the chosen anthem amongst Glasgow drunks – “Hand na-ow, the hend is ne-ah”) than anything else. I'm not kidding. I have been treated to a rendition of this on a bus by a Glasgow drunk whose false teeth didn't fit. He had a perfect, but very ill fitting, set of top dentures and two yellow bottom teeth - and I don't mean two yellow teeth in an otherwise perfect set. That's all he had - two yellow bottom teeth. And his top set moved independently - almost shooting out on occasion, only to be sucked back in again. It was like watching a badly dubbed Hungarian film. An Edinburgh drunk might treat you to an aria from Wagner's Ring Cycle. There’s a lot to see in Edinburgh. Apart from the castle, there are some really great historic buildings, a Museum of Childhood, the cemetery where bodysnatchers Burke and Hare plied their trade and some underground streets which were supposedly blocked off during the plague and the residents left to die a slow painful death (did I mention that Edinburgh was less friendly than Glasgow?). There’s also the Heart of Midlothian. As well as being a football team, this is a paving slab which is in the centre of Edinburgh, it’s heart shaped, and it’s supposed to be at the heart of Midlothian (the district Edinburgh is in). So, unable to come up with something witty or apt, they called it the Heart of Midlothian. It’s supposed to be good luck if you spit on it and means you will come back (Rome gets a lovely fountain full of coins, Scotland gets a bit of stone covered in spit - lovely - no wonder we had the plague). I once took a friend through to Edinburgh and told her this story, so she decided to spit on it for good luck. Unfortunately, it wasn’t very good luck for her, as the wind was blowing quite strongly and, well, to be frank, she didn’t check the wind direction very carefully and she ended up with a faceful of spit – only some of which was her own. In Glasgow, we don’t have a special place to spit, people just do it wherever they like. I suppose that’s another cultural divide between the two cities. Glasgow is not as rich in historical culture, and consequently doesn’t have as many tourist attractions, although it does have a beautiful square (if you watch that webcam long enough you will see a drunk bloke peeing on the statue of Queen Victoria), some great museums and galleries. It also has better shopping. Much better shopping. Glasgow also has better clubs (although if you go to some of them, you might be able to test out the Glasgow stabbing/ Edinburgh wedding theory. Clatty Pats, sadly, has since closed down, although a much more upmarket club has taken the name for a special once a month - I wonder if they are resurrecting the sticky carpets along with the cheesy 80s disco music). Many of these clubs are not places to go to when you’re sober. And if you do, you’ll hurriedly remedy that in a bid to forget the whole horrendous experience. Back to Scotland. The wild west is the most dangerous place to live with the murder rate in Strathclyde being almost 50% of the total. We’re a bloodthirsty lot over here in the west. Almost half of the attackers were drunk or on drugs (no surprise there, then – presumably they do it when taking time off from peeing in alleyways). As a 46 year old woman it’s reassuring to note that I’m relatively unlikely to be a murder victim in Glasgow. A thorough analysis of the statistics shows that I can lower my chances still further if I hide the steak-knives, only go out on Tuesdays, and try not to make anyone angry. I’m not convinced, however. Having been mugged three and a half times, I feel as though I may be walking around surrounded by neon lights, only visible to the criminal eye, which spell out ‘Lookee here, a crime waiting for somewhere to happen’. The traditional view of murder on the east and west coasts is that in Edinburgh the murders are carried out in secret behind the locked doors of elegant Georgian houses, whereas in Glasgow it’s all drugs, razor gangs and Taggart drawling “There’s a boady in thuh riv-uh”. Needless to say, there are plenty of net-curtained suburbs in Glasgow, and the regal Georgian terraces in Edinburgh are just as likely to house brothels and drug dealers as the housing estates are. I currently feature 90 or so crime writers on my blog - http://www.bigbeatfrombadsville.blogspot.com/ - some of them live in Scotland, some were born in Scotland, some of them set their books here. They range from the cosy, to the ultra dark, and they write about domestic murders, serial killers, conspiracies and random acts of senseless violence. There are amateur sleuths, policemen, PIs and forensic experts. Their books are set in the past, the present and the future, in cities and in towns, and in the highlands and islands. That's rather a lot of crime fiction writers for one small country. It must be something in the water. Probably a dead body. So, dear Kaye's readers, do you have any favourite Scottish authors? Have I missed any off my list? I'd love to know! And where is your favourite setting for a crime fiction book? Oh my! You're the wee lass who wrote the bedroom scenes from different genres -- one of my favorite bits of silliness of all time. I always share it (properly attributed, of course,) with my writing classes. And now I've checked out your own blog with the scene on the bus and I'm kicking myself that I haven't read your books -- yet. I'll remedy that soon. Looking at your list of Scots crime writers after reading about the crime scene in Glasgow makes me wonder if half the population is out committing crimes while the other half is writing about it. I had no idea there were so many! I'm familiar with only a few, Doyle, of course,Tey, Mina, Rankin,and McDermid. And I'll be adding Moore to that list very soon, for sure. Thank you so much for your comments Vicki. Yes, the bedroom scenes was me :o) And there are indeed a lot of crime fiction writers here! I hope you enjoy the ones you try. Fascinating! I remember when I was a student in the UK in the early 90s and was making a trip to Scotland. There was a great argument at the magazine where I worked over whether I should spend my tourist dollars in Glasgow or Edinburgh. I was amazed how heated it got. I did end up in Edinburgh, but always was curious about Glasgow. MC Beaton is a favorite of mine to read. And your book sounds fascinating--can't wait to check it out. Your post was a delight to read and one is now enlightened of the divide between Edinburgh and Glasgow. Perhaps that is why I live in the heart of Scotland - rural and somewhat isolated and yet the mystique beauty we have in abundance here in Scotland.